Do you like brownies? Do you like cookies? Then you're in the right place. 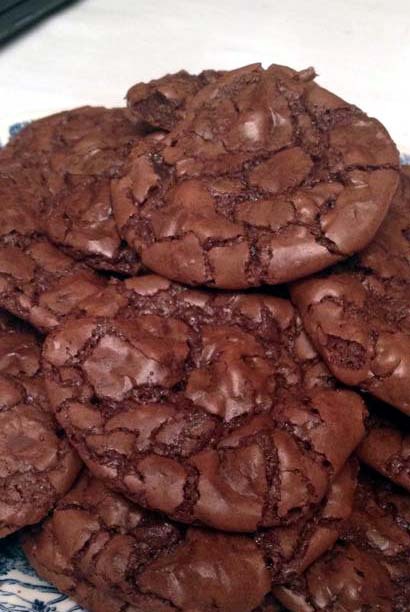 These cookies have crunchy outside, like the top of a brownie, and chewy middle. If you like chocolate, you'll enjoy this recipe a lot. Delicious! Using a stand mixer, combine butter, sugar and brown sugar in the bowl. Beat until smooth. Add vanilla extract and eggs. Continue to mix until well-combined. While continuing to mix, add a little bit of flour and melted dark chocolate. Alternate between the two until used up. The mixing process is made easier by using a stand mixer. See video below. If you don't have a stand mixer yet, check out the Hamilton Beach Classic. It's inexpensive and ready to go. On a cookie sheet, arrange a spoonful of batter. Leaving a lot of space for when the cookie expands while baking. Remove from oven and cool for at least 15 minutes before serving. You can probably substitute milk chocolate or white chocolate for dark chocolate. But in my mind, dark chocolate has a health component to it, such as helping prevent heart disease. In any case, dark chocolate is delicious, so that's all that matters. If sweets are not your thing, check out my recipe for baked garlic potato slices.